Just when you thought your 2017 corn crop had suffered every indignity that weather and the grain markets could dish out, another hit to the area’s corn arrived in the form of Goss’s wilt. According to research data from Dupont Pioneer, yield robbing Goss’s wilt and leaf blight is a bacterial disease that causes leaf loss, poorer stalk quality, and light test weight corn. Higher levels of corn residue from corn-after-corn production and reduced tillage contribute to the spread of the disease and these are both practices we see in this part of SD. 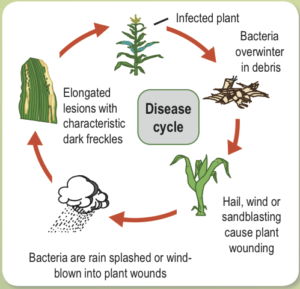 Summer storms that produce hail, wind, or rain that damage corn leaves can also impact the severity of the infection and loss in any growing season. This year, there are farmers in our region that have experienced all of these weather events. Crops have rebounded in some areas with summer rains but another culprit looms that can reduce yields even more. Goss’s wilt overwinters in infected corn residue and host plants such as green foxtail, barnyard grass and shattercane. From this infected residue, bacteria are transferred to growing plants. Bacteria invade the plant tissue through the wounds caused by hail, heavy rain, wind, or mechanical damage. Infection can happen at any stage of development. Wet weather and high humidity encourage the spread of the disease. Sadly, Goss’s wilt isn’t too fussy and will spread in hot dry conditions as well. Even if you remained in a drought area this year, you still are susceptible to the Goss’s infection. Goss’s wilt is in our area and once it is here, it is here to stay. The disease, now a crop management factor for us, may be transmitted from field to field by tillage equipment, balers, and ever-present South Dakota wind. Management of the disease is critical. 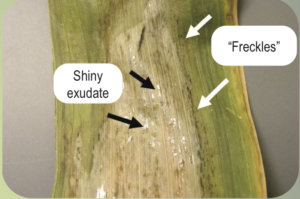 However, Goss’s wilt is a bacterial infection – not fungus, so foliar fungicides are not effective and there are no rescue measures available to control the disease. Crop rotation, tillage when practical, reducing crop residue, and minimizing grassy weeds can help. The primary method for management of this disease is hybrid resistance. Levels of resistance are rated in Pioneer brand corn seed using 1 (susceptible) to 9 (resistant) scoring systems. This fall, when making your hybrid seed selections to plant in 2018, visit with your seed provider about the hybrids that offer the appropriate levels of resistance for each of your fields. For some growers in this area, the dismal growing conditions of the spring improved throughout the summer months. Hail, wind, and drought played a role this year as well. Though it can be frustrating to deal with these issues, it is amazing how resilient the corn and soybean plants are. Yields look much more promising than we deemed possible earlier on in the growing season. Mother Nature can deal out some tough blows as we have seen in hurricane affected Texas and Florida and Montana’s wildfires. Guess I‘ll stick with the hassles we’ve got. Wilt and all.